The Snowspruce condos for sale are two-story townhome-style units in a small complex of only four condos. They share a common, woodsy entrance and are all the same size and shape with three bedrooms, three baths and more than 2,000 square feet of living area. 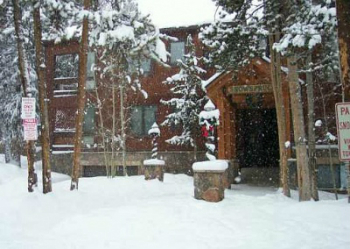 The living room, dining area and kitchen are upstairs where the views to nearby Peak 9 are the best. The free town shuttle will stop outside on the Columbine Loop, and makes it easy to get anywhere in the area from the Snowspruce condos for sale. Keep reading about the townhouse-style condos, or browse the Snowspruce condominium listings below. The base of Peak 9 is a quick walk or shuttle bus ride – or a short forest hike in the summer. All the condos on the Columbine Loop share use of the Columbine, or what is sometimes called the Four Seasons Pool and Clubhouse, which has an outdoor heated pool and several hot tubs. Amenities: pool, hot tubs, close to Peak 9, easy walk to town, on the bus route. The Columbine loop is a block from the southern end of downtown Breckenridge and across the Blue River from the Village at Breckenridge and the base of Peak 9. Don't hesitate to contact us for more information about the variety of condominium communities in and around Breckenridge.